Easy travels with Jurlique, Caudalie, Ole Henriksen, Philosophy, Marc Jacobs, Sephora and DenTek! Jurlique Love Balm - 15ml - $9 - a super hydrating balm with vitamin E and the oil of olives, soybeans and safflower seeds that can be used on the spot to treat dry patches. It also comes in a Rose formula but I like the tangerine scent of the original one! I like this for travel because it's a super multi-tasker - works for dry lips, cuticles, eyes and any sort of dry patch. It's also great in a pinch for split ends and smoothing down frizzies. And because of it's solid balm formula, you won't have any trouble keeping it in your purse and getting it through airport security! Caudalie Beauty Elixir - 30ml - $19 - tones, tightens and provides instant radiance - just what you need after a long flight. 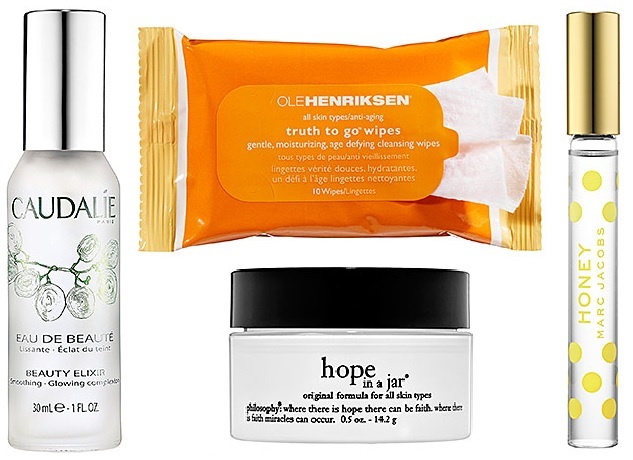 Ole Henriksen Truth To Go Vitamin C Wipes - 10 wipes - $7.50 - for easy cleansing and makeup removal on the go. Philosophy Hope in a Jar - 30ml - $20 - lightweight with a creamy texture, works great for day and night so you can avoid having to bring two creams. Marc Jacobs Honey Rollerball - 15ml - $30 - a sunny scent perfect for warmer climes! Sephora Carry On Airless Travel Set - $34 - a set of easy-to-fill air-tight, airline approved sized tubes (2 x 30ml and 1 15ml) and a refillable jar (15ml) that can withstand altitude changes with convenient waterproof labels, a piston push back and spatula. All inside a mesh cosmetic bag that will easily get through security. DenTek Floss Picks - 75 picks - $2.99 - with a multi-filament texture that removes food and plaque as it deep cleans between teeth while massaging the gums and has a unique tongue scraper and a minty taste that helps freshens breath. I also keep a couple in my desk drawer and my purse because you always get something gross stuck in your teeth when you aren't near your bathroom!